Your hairstyle has changed. You are noticing your forehead is getting bigger. Now you have more face to wash than hair. Your receding hairline at temples is making you look older. Research shows nearly two-thirds of men begin to see their hair locks disappearing by age 35. 85% of men will notice significant thinning hairline by age 50. (1) Isn’t it a relief to know you are not alone? But that does not answer your question. How to stop receding hairline? Age plays a vital role in hair loss. However, there is something you can do to help it. One of the major causes of receding hairline in men and women is malnourishment. You may look buff and healthy or have plenty of energy left in you, but subtle vitamin deficiencies show up as hair loss. (2) Read the signs. Having an ideal work-life balance these days is next to impossible. Hectic schedules, morning rush and putting off meals to attend meetings have become second nature to most of us. The result is insufficient time to eat balanced meals. Everybody’s body constitution and tolerance are different. Your poor eating habits start showing up from your hair. First, your hair begins to lose its luster, the bright healthy color fades away. Then you start seeing more hair, than teeth on your comb every time you run it through your head. A trichologist is a person studying the science of hair. What you could learn from consulting with a trichologist is very eye-opening and beneficial. Make a few simple lifestyle changes. Go on a receding hairline diet. Foods rich in vitamins and minerals will be beneficial. The best part is, no particular precautions are prescribed, except against rigorous messaging, since the remedies are natural and have no side-effects. It is a simple yet effective change that you can make. Say no to junk foods. Cholesterol, trans fats (3) and high sodium in junk foods are not only dangerous to the heart but also, they impede absorption of nutrients in the body. You may look fit or overweight, and wonder – “why is my hairline receding even when I look healthy?” Get rid of junk foods from your pantry. People eating junks foods may look overweight but may also be ill-nourished. Eating a balanced, fresh home-cooked meal will let your body absorb the nutrients like a sponge. Your body and hairline will thank you in the years to come. Exercise is great for the body mind and soul. Exercising regularly for 20-30 minutes a day not only keeps you fit but also releases a happy chemical in the brain called endorphin. These endorphins help you de-stress and stay happy. A happy mind is the first step towards achieving the state of the happy body. Stress and depression are among the major causes for hairline loss. Exercise is a natural way to increase overall body circulation. Oxygen carried through the blood to the scalp will massage and stimulate the cells and the follicles to stay strong. Time and again, doctors have been advising – drink 8 glasses of water a day. Water increases blood circulation, improves digestion, and keeps the body hydrated. A Well hydrated body and skin will fight the growth of bacteria and fungus in the scalp. Keeping the scalp well moisturized will keep away dandruff and other scalp infections, facilitating strong hair and regrowth. It’ll be a matter of time, you get over your widow’s peak hair growth issues and get back that mature and thick hairline. This freely available vitamin is hardly being utilized as prominently as it should. We have taken sunlight for granted. Sunlight is the best and abundantly available source of vitamin D.(4) Step out to get some fresh air in the sun during your breaks or simply stand in the sun for 10-15 minutes each day. Vitamin D is not only associated with healthy bones but also helps in keeping hair roots healthy and strong (5). Start eating healthy. Eat foods rich in vitamin B. This vitamin is water soluble so you can never suffer from excessive vitamin B. Any excess amount will get flushed out through urine. Vitamin B helps in improving blood circulation. It carries the vital nutrients to the scalp strengthening hair follicles. Vitamin B also moisturizes the skin from the inside. This helps in keeping the hair healthy and shiny. No more dry hair or breakages. Foods like broccoli, whole grains, mushrooms, avocado, cheese, and eggs are rich in vitamin B (6). Vitamin A helps in restoring the moisture balance in the body preventing dry hair and breakages. Remember vitamin A is oil soluble. So, to see best results these foods must be combined with fats like cheese, olive, etc. for best absorption. This is especially beneficial if you are observing balding patterns in a young age. Some of the foods rich in Vitamin A are – carrots, tomatoes, spinach, bell peppers, sweet potatoes, tuna and red meats. Vitamin E is not just for beauty skin treatments; it is the answer to the commonly tormented question…. “How to make your hairline grow?” It has more to it than we know. Vitamin E has rich antioxidant properties which help in stimulating hair follicles and promoting hair regrowth(7). Regular intake of vitamin E has shown positive results by regenerating hair follicles in balding heads. Foods like avocado, nuts, whole grains, and honey are rich in vitamin E.
Combine a quarter cup of castor oil with a cup of coconut oil. Warm up the mixture and very gently massage your scalp for about 30 minutes to reduce hair fall. Do not rigorously massage your scalp or you will see more hair fall. Leave it in for an hour and wash. Repeat the process thrice a week for about a month. You will be happy with what you see. A hot oil massage not only helps in moisturizing the scalp, it also improves blood circulation and helps in opening the clogged pores that have been restricting hair growth causing front hairline thinning. Lemon juice is another one of nature’s hair buddies. It is one of the age-old answers to-‘how to help receding hairline’. Lemon is a rich source of vitamin C. Its citrus properties help in fighting stubborn hair dandruff. Apart from killing the fungus causing dandruff resulting in a balding hairline, it also keeps the hair healthy and moisturized. Olive oil is a great moisturizer. It is loaded with vitamin E which helps to fight hair loss. Make a mixture of one cup of olive oil and 1 lemon juice and refrigerate it. Massage it into your scalp for 15-20 minutes. Soak for an hour and wash your hair. Repeat this 2-3 times a week for best results. Don’t throw away that egg yolk. The benefits of egg yolks are undermined due to their cholesterol content. Egg yolks are rich in proteins (8). Use them. Make an egg yolk pack mixing one egg yolk with 2 teaspoons of lemon juice and one ounce of olive oil. Mix them well and apply the mixture to your scalp. Leave it in for about 30 minutes. Apply a shampoo on it and wash with warm water. The proteins of the yolk and all the goodness of lemon juice and olive oil will get absorbed giving your scalp a good boost to help frontal hairline regrowth. Neem is known to have great antibacterial, antifungal and anti-inflammatory properties that help cure scalp infections and dandruff, which are among the main reasons for hair loss. Blend a hand full of neem leaves with 2 cups of water. Filter and use it to wash your hair. Neem is also known to prevent receding hairline and premature greying. Aloe Vera is loaded with natural goodness. 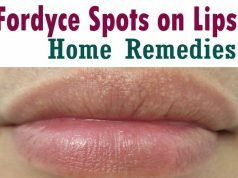 Its use for beauty skin treatments is no secret to any woman. Apart from that, aloe vera is used in healing multiple ailments like digestion problems, heartburn, acid reflux, constipation, and weight loss. Application of aloe vera juice on hair is considered one of the best way to stop hair loss. This juice moisturizes and soothes the scalp, reducing dandruff and hair loss (9). Apply aloe vera juice or gel on your scalp and soak for 15-20 minutes. Rinse with warm water. The onion juice hair fall therapy has been catching fast like wildfire. People have posted several positive results online and swear by it. Why not try it? Onions are believed to increase blood circulation. Onions are also rich in sulfur. The juice of an onion applied to the scalp will work instantly by boosting it with sulfur, aiding in supporting strong and healthy hair (10). Strong hair doesn’t break or fall, thereby eventually restoring healthy hair to the scalp. Onion juice is also believed to be rich in collagen which helps in producing healthy skin and hair cells. 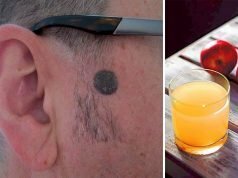 How to lower hair line with onion juice? Simple! Blend an onion and extract its juice. Mix it with one tablespoon of coconut oil and gently massage into the scalp. Leave it in for 20-30 minutes and mild shampoo with warm water. This procedure must be followed diligently 3 times a week for 3 months for best results. The goodness of coconut and its milk is unquestionable. Coconuts are rich in vitamins C, E, B1, B3, B5, B6, and minerals like iron, selenium, magnesium, and phosphorus. Coconut milk has immense moisturizing properties. Massaging it into the scalp will not only moisture it but also replenish it with the other necessary vitamins and minerals, effectively combating female receding hairline. Massage the scalp 10 minutes a day to restore its moisture and strengthen the roots to prevent hair fall. This is one kitchen aid that deserves the respect of a king. It is the solution to innumerable problems right from repelling insects to several ailments. The natural oil from your scalp has a pH level of about 4.5 to 5.5. Dust, pollution and unwashed hair can disrupt this balance causing fungal and bacterial growth in the scalp, resulting in hair fall. Apple cider vinegar restores the natural pH balance of the scalp protecting it from fungal and bacterial growth and promoting healthy hair and skin. Wondering how to bring back a receding hairline using this all-purpose kitchen mate? Rinse your hair with apple cider vinegar after shampooing. Let it sit for about 5 minutes and rinse to have healthy a healthy scalp and strong hair. Apple cider vinegar also gives a lustrous shine to your hair. Everybody is different and so is their constitution. As to what causes hair loss cannot be pinpointed straight shot. Deficiencies and malfunctions vary across people, based on eating habits, stress levels, and the level of exercise they do. That is why there is no one solution for all. You know your body well. Try these remedies and see which one suits you best. Experts say it is ok to lose 70-100 strands a day. Hair grows at a slower pace as we age. It also applies to receding hairline in women. Falling hair doesn’t grow back at the same time. But, when these strands don’t grow back at all- that’s what results in baldness or a patchy scalp. Ethnicity plays a major role in hair regrowth. A study conducted by researchers from the University of Michigan shows that women of Asian origin saw their hair grow the fastest. Genes also play a major in baldness patterns irrespective of being male or female. If your grandfather and father lost all their hair, so will you. Don’t give up! 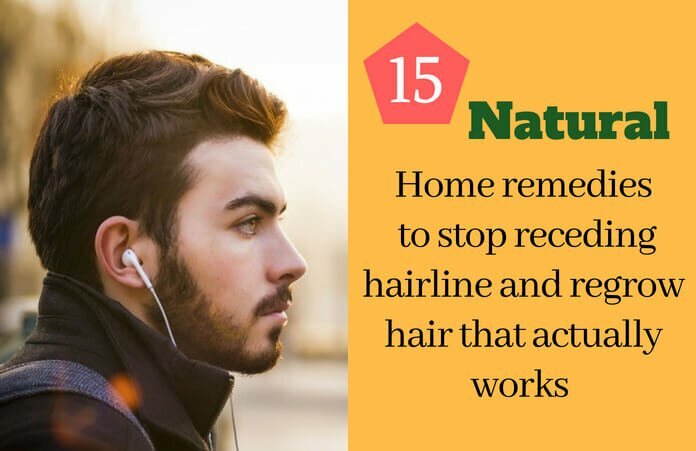 Trying the natural home remedies is sure to help you restore some of the lost hair. A final word of advice. Don’t stress yourself out over your hair. The more you worry the more your hair falls.